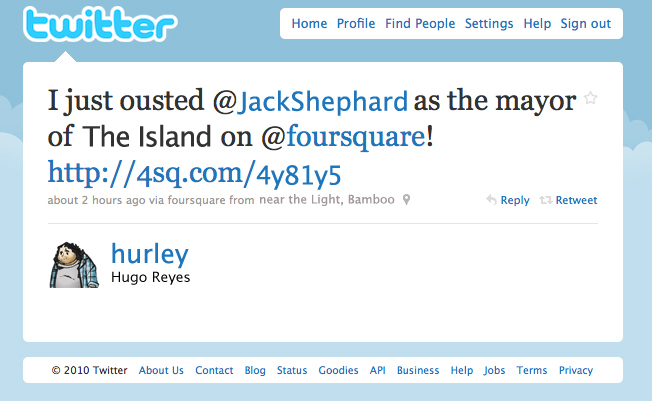 Hurley spoils the ending to LOST on Twitter by checking in on Foursquare. I’m a big fan of Papa John’s Pizza. I would buy from Papa John’s over any other chain today; if one opened here in London I would be first in line to buy a large pie. No Joke. I’m a fattie; but I can’t pass up a nice ‘za from Papa John’s. When we would order pizza at the office, I would ALWAYS order from Papa John’s (if only for the cheap price and fairly prompt service).I looked through my flickr stream and was actually suprised that I did not find a single picture with Papa John’s Pizza boxes in it. That being said, I’m fairly sure there are a couple in there; I just didn’t tag them correctly. This post; however; is all about free pizza. We ordered from Papa johns about once or twice a month at home; and only had to complain about the service we received once. We called and complained that we had waited over an hour for the pizza and found that the order hadn’t been filled at all (despite an email confirmation being delivered to me). I wasn’t upset; the pizza eventually arrived and I was happy to eat it over “House”. Papa John’s wasn’t happy though; they started sending me free Pizzas. I got my first pizza coupon the very next week. We got a large Pepperoni on that one. It arrived on time and we had no problems. The next one came two weeks after the next Pizzas we orderd from Papa Johns. We hadn’t complained. Why did we get a free pizza coupon? Never one to look a gift horse in the mouth, we had a nice pizza dinner and tought nothing of it. Then another free pizza coupon arrived a couple weeks later. At this point I thought I was getting a customer loyalty bonus and just accepted that every time I ordered pizza from Papa John’s, I’d get another one free. It’s been well over a year since I was last able to scarf down a slice from the PJ’s and I kind of miss them. I wonder if they miss me back?